Historically, Lombok has always been a struggling island, and in order for the locals to survive, they had to learn how to carve, weave, fish, or do anything else that would help them stay afloat. Today we’ll talk about the Labuapi Village, home to some of the finest carvers in Southeast Asia. Just like any other community in Lombok, this one has been mastering the art of woodcarving for centuries, perfecting every last detail. The trademark of this place, the biggest tourist magnet is, of course, the somewhat creepy “cold mask.” Take a look at the photos: they do look pretty scary, don’t they? It takes a lot of work to create something that impressive. The expression-less masks have a religious meaning, but for us, the foreigners, they just look cool and make us feel like we’re a part of some ancient culture. The masters of the Labuapi Village also make statues, wall decorations, trays, and many other things. Remember: every single item/object at the village is made from wood and decorated using cukli (sea shells). Their high-quality product is in large demand on the island. Both the locals and the visitors are ready to pay for their exceptional level of detail and durability. 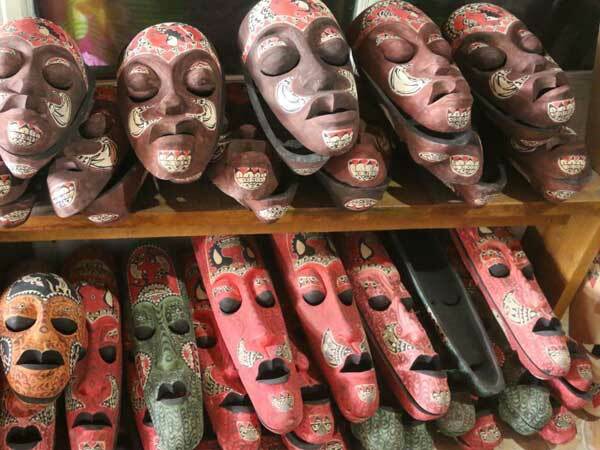 You don’t even have to visit the place to find their cold masks: go to any art market in Lombok and you’ll see several masks waiting for you there, along with other things. So, why do people want to visit the Labuapi Village? Well, it’s always thrilling and exciting to watch the craftsmen work. That’s true for every single settlement on this island: tourists drive/walk for miles just to see everything with their own eyes and maybe even try their luck at carving, weaving, or any other art. Besides, it’s always cheaper to buy something directly from the masters. Now, even though these folks are struggling with money sometimes, their business is slowly, but steadily going up. Plus, they’re already used to tourists taking selfies with them and will even show you the best spots for the pictures and videos in the village. Walk around the place, talk to the kids, the grown-ups, or ask the craftsmen to show you some tricks. The Labuapi Village is very friendly and will make you feel at home. The process of carving out state-of-the-art wooden items takes a lot of time and dedication. There, you’ll be able to watch the masters at work and see how they decorate, paint, and varnish the wood until it becomes market-ready. You might think that the locals get everything from the neighboring forest, but that’s not the case here. Say, the seashells are imported from Lendang Re, a tiny community that is famous for cukli all over Lombok. The material for the masks is imported from Sesaot. Back in the day, the people of the Labuapi Village used mahogany wood for crafting. However, these days, it’s getting harder and harder to get one’s hands on it. That is exactly why they had to switch to jackfruit and mango wood. Another popular source of materials is the Lengkeng tree. It originated in China and has a brown color. Fact: this village became the center of handicraft production in 1995 – 27 years ago. And even when the 1998 crisis hit the country, the locals didn’t really feel its effect. On the contrary: they even reached never-seen-before production highs! Bali is their main importer, along with many foreign countries. The Labuapi Village has a great reputation and agents from all over the world know that their production deserves the highest praise. I know I just said that they officially started doing business in 1995, but that doesn’t really mean that’s when they learned how to craft. This art has been a part of these people for many decades, if not centuries. And while in other countries, the government is spending a lot of time, energy, and funds on making sure villages like this one survive, in Lombok, folks are used to relying on themselves. You can see it in their eyes and the way they talk to the tourists. Independence is the #1 priority for them, and they’re doing great on that front. If you really want to see the entire process of carving from the very beginning, make sure to get there early in the morning. First of all, that’s when they start. Second, the Labuapi Village will be half-empty then, giving you an opportunity to talk to and maybe even work a bit with the craftsmen. And don’t go spending all your money on the first collection of items you see. There are many masters working in that settlement, and they’ve got their trademark stuff. So, go around the entire village and check everything out before committing to something. I bought a whole lot of things but was happy with every single one. Without a doubt, handcrafted masks, bowls, and trays will be perfect gifts for folks back home. Everything is cheap in Lombok, and that is why you’ll constantly see foreigners buying tons of stuff from the markets. The Labuapi Village does rely a lot on the tourist flow and does everything in its power to please the customers. At the same time, it’s worth mentioning that these people have been selling their product for many years, which means they know exactly how to appeal to the foreigners. Keep in mind that bargaining will help you drop the price significantly, up to 20%, if not more. Don’t let them fool you and rob you of your bucks. So, Should You Visit This Village Or Not? There are 10 art shops in the area, and they all sell unique, affordable, and hand-made items. So, even if you’re not really interested in the art of woodcraft and/or have no desire to travel for miles to get there, just remember that the special atmosphere of the Labuapi Village will be enough to make the trip worth it. Try spending an entire day walking around the village and talking to the locals. You’ll hear crazy and uplifting stories, and that’s priceless. Personally, I was skeptical about it, simply because I’ve been to one too many craft-oriented settlements in Lombok. Still, this place managed to impress me. Currently, the UK, Australia, and New Zealand are highly interested in what these masters produce, and the demand is increasing every year. Pretty much all families living in the Labuapi Village are involved in crafting. You’ll feel like you ended up in a fairytale town where handicraft is the only thing the locals can do. These carvings represent the very essence of Lombok and the Sasak people, and the amazing balance between price and quality is what attracts countless tourists from all around the globe. Again, I highly encourage you to visit this place, along with all the other villages that make a living on crafting something unique and beautiful. I think this could come as a surprise to you, but this village isn’t located somewhere on the outskirts of Lombok. No, it’s actually very close to Mataram, the capital, and you’ll hear folks call it a part of the city. Therefore, if you’re in Mataram right now, you can just walk to the Labuapi Village and forget about renting/hiring/using public transportation. Even if you’re at the Lombok International Airport, the ride will take you 30-45 minutes. The fastest route is through Jl. Bypass Bandara Int. The road is nice and straight; traffic might prevent you from getting to the destination in time. The Jl. Raden Puguh is the longer route. You’ll need up to 50 minutes for it. In any case, the village is always within your reach, especially compared to far-away spots like the Kuta beach or mount Rinjani. Once you land at the airport, hire a taxi. The driver won’t charge you much since the distance is short. And after you enjoy the village and walk around the city, think about renting a bike or a car to do some sightseeing while behind the wheel. Do whatever fits your current mood best and try to get the most out of your trip to Lombok. I made friends with a local girl and she told me a lot about the regular lives of the villagers. To me, they are heroes. For the regular tourists that are in Lombok for fun, this place will be boring. For the rest of us, it's priceless! True, as presents, these amazing things are perfect. I bought two trays for myself. The Labuapi Village is practically a district of Mataram, and you can see that they live better than the rest of the village folks. I actually bought a couple of masks during one of my earlier trips and recently discovered that they were made in this village.